Sir, As practising geoscientists working in UK universities and institutions, we recognise the potential existence of a nationally valuable and exploitable shale gas resource, and support its development subject to a firm but realistic regulatory framework being in place. Part of this framework is the traffic-light system used to manage the risk of damage being caused by induced seismicity associated with hydraulic fracturing operations. At present it is set very conservatively to be triggered by extremely small seismic events (above 0.5 local magnitude). This is very far below the levels set in other countries, or for other comparable industries in the UK (such as quarrying, mining and deep geothermal energy). 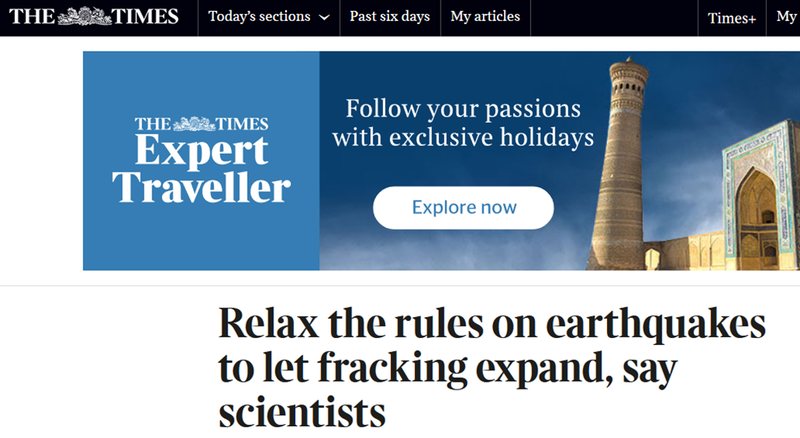 It is widely believed by industry, and among informed academics, to be so low that it threatens the potential development of a shale gas industry in the UK. The scientific rationale for this trigger level is debatable. The threshold is not something that is absolute, and in the spirit of the declared intention expressed in the original Department of Energy and Climate Change document in which it was proposed, that it should be subject to continuing review, we urge the government to instruct the Oil and Gas Authority to commission an expert review of the present traffic-light system threshold levels without delay. ← Kids To Strike For The Climate! Isn’t it unfathomable how, and why, the Antis have got such a grip on this issue, founded on nothing by hollow prejudice ? And do they really hate our own country so much that the material and financial benefits that will arise through proper fracking, mean nothing to them ? They will mean a great deal to the rest of us, so lets press for relaxation of these foolishly restrictive diktats. Simple. Energy and Climate Change should never have been put into the same Department! The day I become Prime Minister, Energy goes to Trade & Industry and Climate Change to Culture, Media & Sport, a Department I propose to axe as soon as I have moved Media back to the Home Office and Culture and Sport to Education. Unfortunately the call to save my country is yet to come! The Government does not listen to Scientists, just Quangos & NGOs. The Government principally listens to the Green Blob, who know nothing! The earthquakes are usually caused by pumping used water back into the formation. Treat it on the surface. Yes, that costs a lot more. Add it to the pump price, most people won’t even notice. The regulations have long stated that waste water is NOT reinjected into the formation but is collected in double skinned, sealed tanks which are stored on a bunded area. The waste water is then taken to an officially appointed waste water treatment facility. Far worse waste water is created in many other industries in this country. Treating waste water is nothing to be alarmed about. Unfortunately, the Green NGOs and their stooges always like to ignore those facts and like to claim that the chemicals are toxic WRONG, they have to be non hazardous to groundwater by UK regulations. Again the NGO’s fail massively in telling the truth. Why do they go into communities uninvited and try and kill off an industry that would have huge benefits for our country and communities? BECAUSE they make MONEY on the back of scaremongering. Grannies donate from their meagre pensions because these Green NGOs tell them they can save them from the evil that is fracking….. The campaigners in NGOs such as Greenpeace, Friends of the Earth and the Campaign to Protect Rural England earn around £40,000 on average….often local residents in areas where shale gas is proposed earn less than half that. The devil is in the detail, the devils in the Green NGO’s ignore the details. They use headline grabbing sentences to ruin our economy only to fill their coffers with dirty money. The art of capitalism is not lost on the socialist loving Green groups, who incidentally are prepared to sacrifice elderly people to fuel poverty whilst they turn up their own gas heating. The government is well aware of the science you mention. Sadly Humfreys will place this well beneath the letter from these geoscientists; so she will not have a clue upon which to make a decision. OK another report? OK- off my back. What’s next? – No action. I don’t know what the Richter measurement would have been for the piling works for the Rampion windmills, but it was stronger than any natural earthquake we’ve had recently, so ~4 would be my guess. Many times per minute, hour after hour, month after month. Strong enough to shake dust down in my house 10km away, to keep me awake, and give me headaches from the shock waves. Why wasn’t that stopped? You make a very very good point here MrGrimNasty. Noooo….0,5 is very, very dangerous! So say all us Norwegians who are happy to provide lots of expensive gas to nervous Brits. Do not rock the boat (or island). The Realm shalt neither be shale-shaken nor stirred. Your post has saved Russia and the KSA from commenting. The period 1850-1900 is interesting in world history. The USA had 31 ststes in 1850 snd 45 in 1900. In between it had a civil war. Livingstone “discovered” Victoria Falls in 1855. Burke and Wills crossed Australia south/north in 1860/61. Speke and source of Nile 1858. Antarctica was left in peace until the 20th century. Peary at North Pole in 1909. Yukon gold rush 1890s. Bates started to explore the Amazon scientifically in 1848. But Climate Science has a baseline during this period. Complete fairy tale. It is a bad reputation problem stopping the industry, it is it does not benefit the landowners who are doing objecting. In the US the industry did have leaky wells of around 5% of all drilled and by and large misunderstood local opposition to having groundwater polluted and what it could do to them, the UK opposition groups cooperated with the US ones and regardless of promises the bad reputation gained in the US is what has driven the UK movement. In the 1980’s Vale Royal Borough Council allowed a PCB dump in mid cheshire by a private company which said it could neutralise PCB’s in a fomb, it managed to make a lake of PCB with a fomb top and the council buried the bad news and the location of the dump on a farm, Winnington Northwhich 1996 Owen Dean the Parish Councellor chief at the time was estatic in ‘solving’ the potash problem where mustard gas shells from WW1 were deposited in a huge waterlogged above ground pond by ICI where the County Council now buried the leaking dump in a bigger hole rather than extrating the potash, wiler Northwich 10 years later was using the potash to stablise the town by filling in the bell brine cavities which caused it to sink, Mustard gas has a shelf life of 5 years and the potash had long dissolved the munitions. Niether the MOD or ICI sent a penny to resolve their liability. I regularly passed a licensed private dump between Church Minshull and Minshull Vernon on the way to Crewe where it turns out the company concerned dumped industrial waste on landfill licensed for domestic waste only, been closed 10 years, nobody has removed the dump. Every country has its horror stories of corruption and negligence, Lancashire must have some, Ellesmere Port has some or it would not be objection to Cuadrilla exploritory drilling. PAX CORPARATIS has gone out of fashion – if we want the gas it has to be extracted by the state, not the private sector, no toxins, no balls ups allowed and the locals must benefit. I live in the North West of England and each evening we are served by the BBC’s local News. We have followed their coverage of the Cuadrilla Fracking site at Preston New Road near Blackpool for a long time. (Bet you can guess the rest!) The amount of publicity given to the hysterical protesters far exceeds that given to the very brave Francis Egan, Cuadrilla’s CEO, who has remained calm and factual throughout. Late last year, when the gas first started to flow in small amounts, the Newscaster was almost in tears as this was announced. Three jailed activists (protesters) were released from Jail early and the cameras were present. The men announced that there was to be a massive public protest on the coming Saturday – the BBC were glad to give them airtime. This is the same Channel which tells us that the red-brown gas – Nitogen Dioxide – is colourless and invisible. They report the black solid Carbon as a Greenhouse gas. Not one of the protesters can explain why Fracking is so dangerous apart from the usual ‘saving the planet’ and ‘time is running out’ comments. They add ‘we need windmills / solar panels / storage to move forwards’ etc. etc. No idea what the answer is to get some sort of balance on this Green alarmism – perhaps close the BBC down? David is right – it should be our government and not the county who pay for the large Police bill. It sounds like good safety procedures are in place. As I posted last week Cuadrilla’s first well test results were very disappointing – only 100MCFD against their expected 300-800 MCFD (and a US shale well typically 600 MCFD to be viable). Their CEO blames the earth tremor restriction and he is probably right but the possibility of poor permeability cannot be ruled out. The ONLY way forward is to relax the restriction for at least the test well and let’s find out once-and-for-all whether we do or don’t have a viable national resource. I don’t read their announcement quite that way. Have you read the original, or just a report of it? “This is a highly encouraging result and great news for the UK …. Thank you. I haven’t read the report only Silly Jilly’s article – I will read it . Jilly reported the Cuadrilla CEO saying that they hoped for between 3m and 8m CFD – meaningless (that’s why she’s Silly Jilly!). Three million CFD from a shale well is utter fantasy. The very best US Marcellus shale wells rarely produce marginally more than 600 MCFD with constant re-fracking and only the great conventional gas fields like Groenigen get into the millions of CFD per well. As I said earlier Soros’s San Leon Energy didn’t develop a very promising shale asset in Poland (much much better placed to be a big producer than the UK shales) because the gas just didn’t flow. I’ll go to your link now. P.S. for the benefit of non-expert readers, Vernon is using US units so MCFD is Roman M, M=1,000, not 1 million. That means that the projected well production assuming a full frac is comfortably economic. If we take 3 million scf/d then at 10 wells per pad, about 300 wellpads would produce all UK gas demand. Total land use: a couple of golf courses. It doesn’t add up: thank you for your two useful references and I would add one to a 2014 post “UK Shale Gas Potential and Perspectives” which together certainly indicate that the data I got from another source was too pessimistic. Yes, mea culpa, the very good US shales certainly do initially produce in the 2 MMCFD plus range but the decline is to about 700 MCFD after a year. It was Jilly, not me, who introduced the “m” confusion: the Cuadrilla announcement she quoted specifically uses the word “millions” for which the understood abbreviation is MM. But the essence of what I have banged on about remains – shale is very “tight” and deliveries are unpredictable without a significant number of wells (10-20 quoted) being tested and the imperative for the UK is to ascertain whether we do or don’t have a viable resource. My other point has always been that the relatively low flows and constant re-fracking and well replacements mean field activity that may be acceptable in the “land lots of land” of the US but not in rural England. All the more reasons to get on with it and draw this debate to a conclusion. I hope the letter quoted in this post convinces to government to get off the pot and relax the seismic restriction so that testing can proceed conclusively. Again, thank you for your contribution which has made me feel less lonely in the “realities of fracking” discussion.